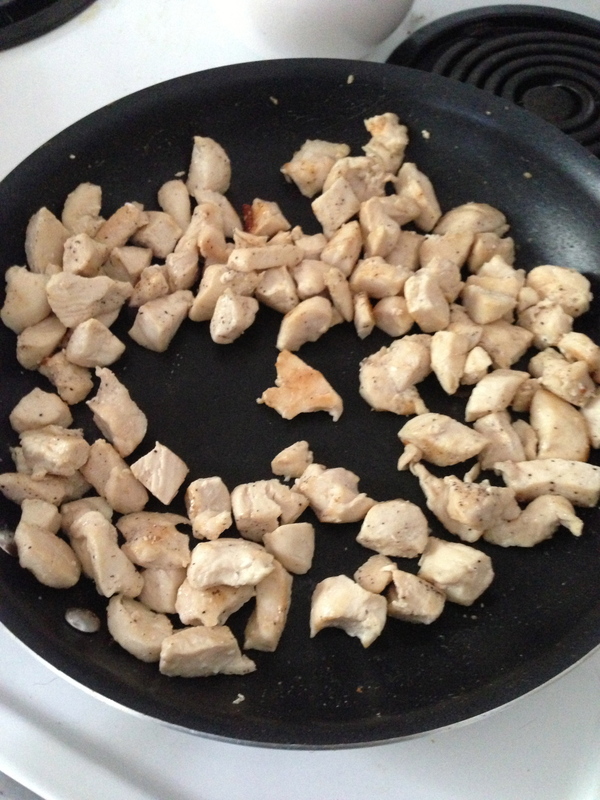 I was genuinely shocked the other day when I witnessed someone cut a chicken breast into cubes, season it and then cook it in a skillet. Hello. Hold up. Wait a minute. That’s a thing? And it’s that easy? Well helllllllllllllllllllllllllooooooooooo new brilliant way to cook chicken. Where have you been hiding this last 8 months I’ve been learning to cook?! 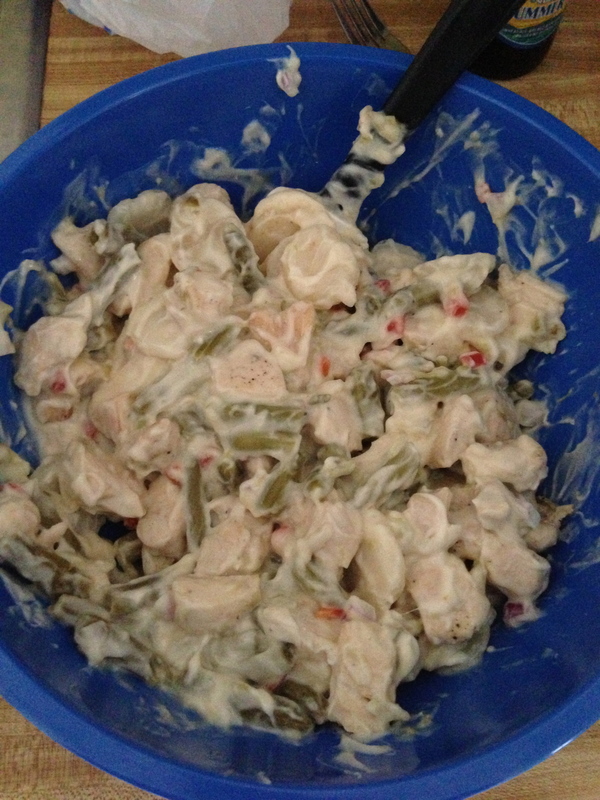 Then, that diced chicken turned into a chicken casserole. And that chicken casserole wasn’t too shabby. Plus, it only used four ingredients. Which is just impressive really. High five new guy* making me dinner, way to win me over with your cooking skills. 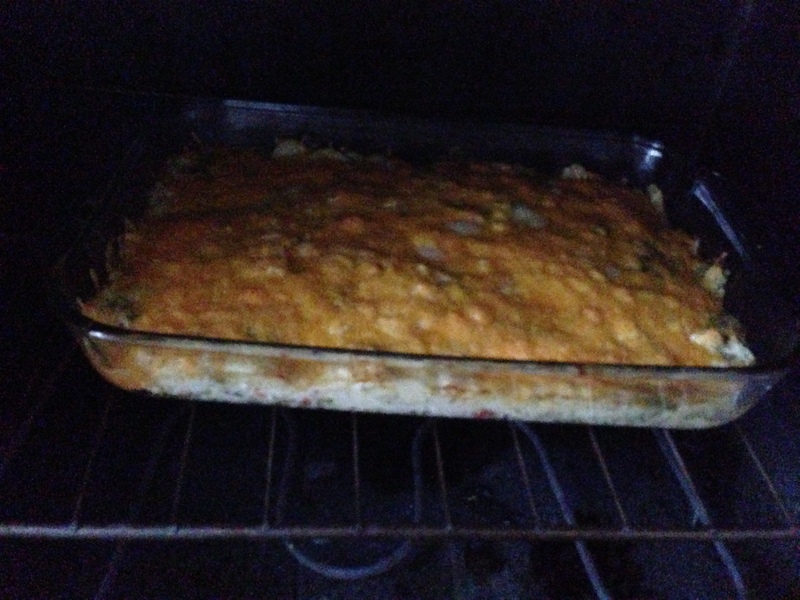 But that recipe made me really crave the chicken casserole of my childhood aptly named Chicken Spectacular. So, I shoot a text (how handy) to my brilliant step mom and nicely ask for the recipe. Be glad I did ya’ll, because boy oh boy are you going to want to try this one. And yes, this is exactly how I got the recipe – I just love that people know me well enough to give me stupid simple directions. So, the cutting of the chicken is a little gross. But with super sharp knives, it’s no big deal at all! Mix ingredients together and pour into a 9X13 pan. I started putting some shredded cheese on top before baking (Chef’s choice, I find myself using shredded cheddar). If you want extra cheesy you could put some into your casserole as well. If it seems dry when you combine the ingredients before baking, you can add more creamed soup and mayo or if you’ve added cheese into the casserole that will help as well. 350 degrees for approximately 50 to 60 minutes. Just until heated through and cheese looks great on top. I would highly suggest NOT using a pan on a skillet and the oven on a very hot day if your house doesn’t have air conditioning. This stores well and makes INCREDIBLE leftovers. Cheese on top = genius. 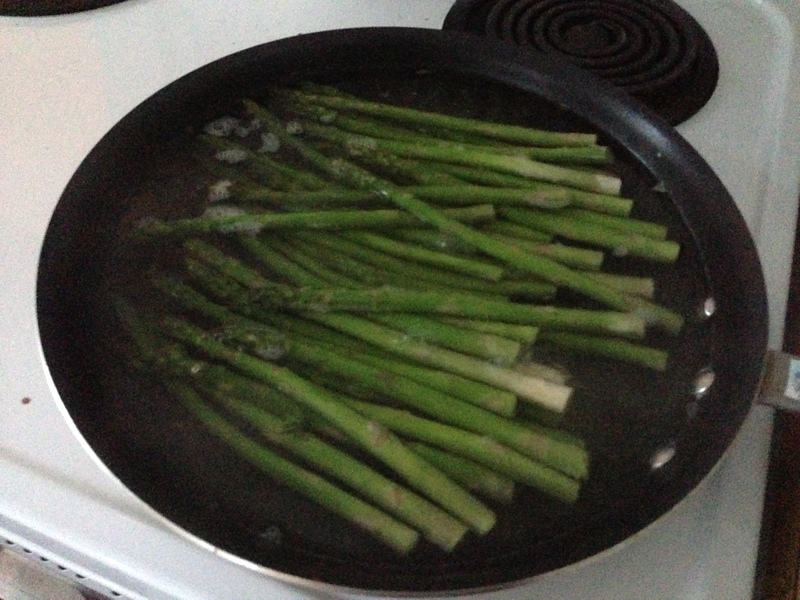 The other lesson I had learned (from admiring new guys cooking) was that you could BOIL asparagus. I’d only ever grilled it before. I did a quick google search, saw that it takes a large skillet, a little salt in the inch of water and 5-7 minutes of uncovered time and tada! cooked asparagus. Salt, water, asparagus. Season to taste. 5-7 minutes of sheer perfection! 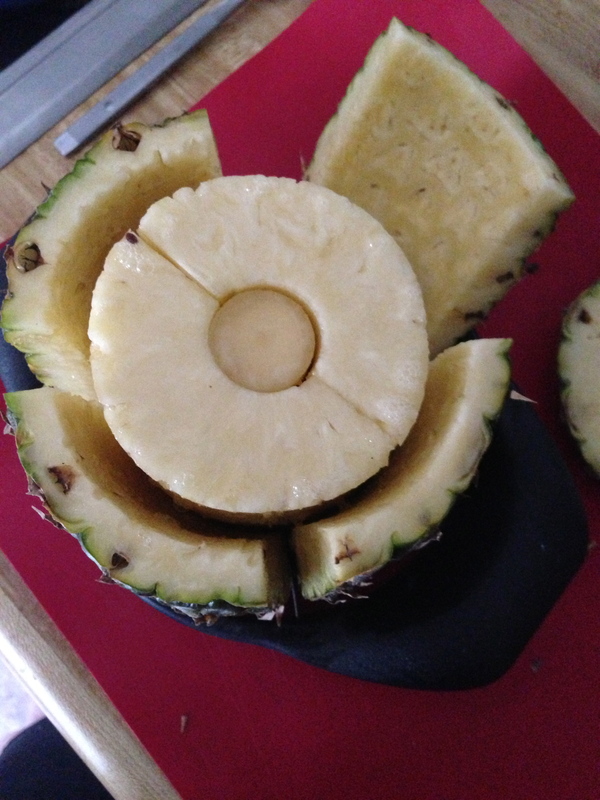 Not to mention, for this meal, I was able to break out my pineapple slicer. Which, shockingly, you just don’t use that often. Tasty delightful perfectly sweet pineapple! It was a wonderful well rounded (very tasty) meal. Totally felt like a mini victory. I can now check “casseroles” off my list of items to learn. Annnnnnnd since I’m feeling pretty proud of myself, I’m going to attempt pretty sugar cookies. You know, the kind with the nice looking frosting that look like they come from a store. To be fair, I’m cheating a little bit, I’ve got a baker friend coming to town and a new cookie cutter I’m dying to use… so there may or may not be a little extra guidance. So keep your fingers that works out for me. Oooooor just know, you’re pretty much guaranteed a funny blog post next week! *Here’s the deal. This blog started off with the purpose of being a happy space to talk about cooking, cleaning, organizing, funny mishaps, finances, random adventures and the likes. It’s also a place where people that live far away can come to check on me and see what’s happening in my life. Which I adore. Thank you friends. But what I’m realizing is, sometimes my posts may include a little personal aside about my family, my friends and in this case my dating life. Because those are the people that surround me and make my stories. So yes, I’m seeing someone new. He’s already inspired me to attempt pan seared steak, boiled asparagus and chicken casserole. Plus, he quietly ate my over-spiced brussel sprouts. He is wonderful, I am happy and I just wanted to let you know.